Here in Portland, OR, snow is a novelty. We are a snow-loving family and so when we see even a 10% chance of the white stuff in the forecast, we get excited. We engage in all sorts of ridiculous shenanigans trying to magically get snow to materialize. Like many other families, we flush ice cubes down the toilet and wear our jammies inside out. My husband swears that not remembering to get the snow tires put on the car is a surefire way to ensure it snows (but of course, he does it anyway because he’s The Daddy and that’s now he rolls). My daughter insists that she can channel Queen Elsa and make snow and ice appear with just a stomp of her foot. My would-be Jedi Padawan believes he can use The Force to choke the snow right out of the clouds. Personally, I have learned that it’s more likely to snow if I’m not expecting it, so I try not to expect (which is a bit of an oxymoron, but whatever). In any case, we will try everything in our power to make the snow we so hope for materialize. 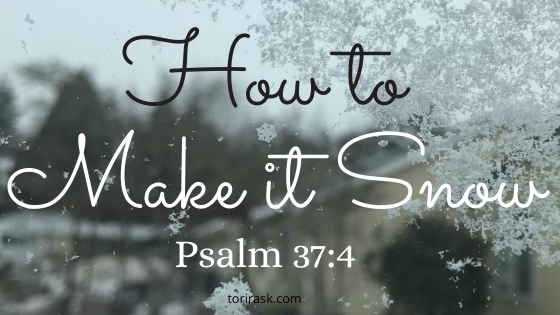 It’s tempting to take this same approach to Psalm 37, verse 4, which says, “Take delight in the Lord and he will give you the desires of your heart.” At first glance, that scripture can make it seem as if taking delight in the Lord is the spiritual equivalent of flushing ice cubes down the toilet. If we delight ourselves in God, then we can get what we want, as if Godly delight-taking somehow magically moves the heart of God to see things our way. Now, there is probably a kernel of truth in that approach. Scripture teaches us that prayer and praise can move the heart of God. For example, the Old Testament tells about several times when Moses changed God’s mind and kept Him from wiping out tribes upon tribes of Israelites in His Holy fury at their disobedience. God is, after all, a loving father and friend and as in any relationship, our conversations, interactions, and feelings matter to one another and can hold sway on the way things unfold. Sign up here to get blog posts, updates, and other grace for the real stuff sent right to your inbox.